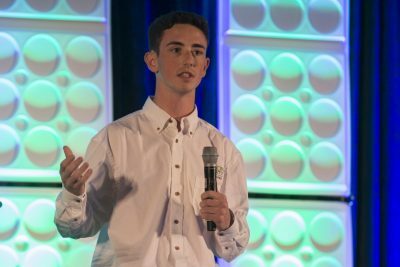 A Stetson University student, Bryson Pritchard from Ormond Beach, Florida, placed second and won $3,500 in the Collegiate Entrepreneurship Organization’s (CEO) Annual Pitch Competition held recently in Kansas City, Missouri. Pritchard competed against 150 students from around the world, advancing through several rounds by successfully pitching his idea for a medical device, at an early stage of development, with great potential for changing how trauma centers across the country can be more efficient and create less risk for patients. CEO is the largest student entrepreneurship group in the world giving nearly 1,000 college-level students an opportunity to attend the annual conference, network with other entrepreneurs, meet and receive mentorship from seasoned experts and compete in business competitions. Pritchard is a sophomore at Stetson, majoring in molecular biology with a minor in entrepreneurship. He was coached by the Prince Entrepreneurship Program faculty, provided mentors outside the university and received assistance processing his provisional patent. In addition to Pritchard, two Stetson University students, Zachary Harshbarger and Matt San Julian, made it into the semi-final round of the competition with Pritchard and Harshbarger advancing into the finals. “This is what we do—work with our students to give them the best chance of being successful with a great idea,” said Lou Paris, assistant director of the Prince Entrepreneurship Program.